The cohort of women of color within Time’s Up have put R. Kelly in their crosshairs. In a statement released Monday morning, Time’s Up called for Kelly to be dropped by companies and venues including RCA Records, Ticketmaster, Spotify, and Apple Music because of abuse allegations against the R&B singer. “The scars of history make certain that we are not interested in persecuting anyone without just cause,” their statement, published on The Root, read. “With that said, we demand appropriate investigations and inquiries into the allegations of R. Kelly’s abuse made by women of color and their families for over two decades now.” Multiple women have accused Kelly of sexual abuse and holding women prisoner in an abusive cult. Many women in Time’s Up — including Ava DuVernay, Shonda Rhimes, Constance Wu, Amber Tamblyn, Robin Thede, Jurnee Smollett-Bell, and Insecure’s Amanda Seales — reposted the graphics calling out R. Kelly on their own social media. 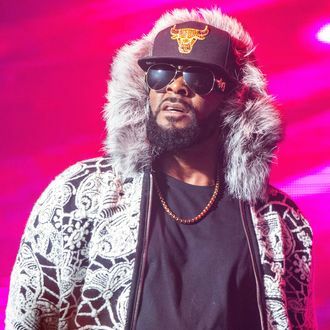 Previously, the #MuteRKelly campaign tried to have an R. Kelly performance at Georgia’s Wolf Creek Amphitheater in August canceled. Time’s Up is specifically calling for an R. Kelly concert on May 11 at the Greensboro Coliseum Complex to be canceled. R. Kelly’s lawyer, publicist, and assistant reportedly cut ties with him earlier this month following a viral interview where Vince Staples called out the so-called “Pied Piper.” R. Kelly has denied all accusations of abuse. Update, 3:40 p.m. ET: R. Kelly’s rep has released a statement to BuzzFeed News calling the Time’s Up letter “unjust and off-target,” claiming that the organization failed to reach out to “any of the women who welcome R. Kelly’s support.” They claim that Kelly is “the target of a greedy, conscious and malicious conspiracy to demean him, his family and the women with whom he spends his time.” Read the full statement below.